The town of Hlohovec lays in southwest part of Slovakia, about 70 km northwest from Bratislava, in a country blessed with rich and old history. The name of the town is not so certain, probably comes from the plant hloh (whitethorn in English) which is widely spread in the area and is confirmed with Hungarian name Galgócz (Hungarian galagonya – whitethorn). 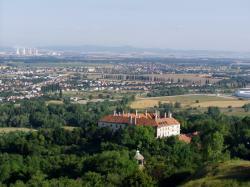 Location: Town spreads in western part of Nitra highlands and south jut of Považský Highland and Váh river lowlands. Part of the town became also once independent villages – Šulekovo (part of Hlohovec since 1980), which lays on righthanded side of Váh lowland between rivers Váh and Dudváh and village Svätý Peter (Saint Peter) part of Hlohovec since 1953, which lays towards north from the town centre on lefthanded side of Váh lowlands. At mornin's dawn, when the first rays of sun appear on the eastern edge of town, they always first touch the high hills embracing Hlohovec, sliding down onto vineyards, fields, and meadows; from there down below to the valley. They slowly creep into the t's streets, slightly pressing against the Windows of the houses to greet their dwellers. Ultimately they touch the surface of the river Váh, coiling down the valley in a wide, arching bow. Such is the beginning of a new day. The surrounding area, widely covered by a number of villages, offers relief in the form of spectacular views to their passersby. Their sight never suffering from the tediousness of a monotonous landscape. The town of Hlohovec lies in the western part of the Carpathian Valley beside the longest of the Slovak rivers, the Váh, at its low part of the ri's flow, set in a wide glen below the spurs of the Považský Inovec hills and the slopes of Nitrianska Pahorkatina hill. The diversity and colourful variety of the hilly country is created by another significant feature of the landscape which is the Váh delta floodplains. Here the country further opens towards the west and southwest to the hills of Trnava loess flatland as far as to the mountains of Malé Karpaty. Our capital city of Bratislava, the castles of Červený Kameň, Smolenice and Čachtice lie in the Malé Karpaty mountains. The memorable Bradlo monument with the Milan Rastislav Štefánik tumulus, and the church towers of the formerly free royal town of Trnava coming up out of the valley will definitely be not missed by its sharp contrast on a nice, clear day. The monumental walls of Leopoldov Baroque fortress protrude from behind the river Váh, and the tall, looming stacks of the nuclear power station in Jaslovské Bohunice are then next to appear in the distance. The Považský Inovec mountain barrier with the hill of Havran lying above Piešťany, known for its spas, dominates to the north of the country. Just when a per's sight seems to have emcompassed all the beauty of the surrounding country, an utterly different view of the Nitra river valley and Tríbečské Pohorie mountains will appear out of the east. The legendary Zobor hill rises from the south spur of the mountains and one of our oldest and most famous cities, Nitra, lies below.